This weekend I violated one of my principal rules as a beer connoisseur. I have stated that I strongly dislike the idea of waiting in line for beer, I even wrote a whole article last year about why it bothers me. Yesterday was my birthday, and on Saturday my wife was taking full baby duty and giving me the morning and early afternoon to do whatever I wanted. Obviously I was going to a brewery, and under the circumstances it had to be one that was a little out of the way and more of a challenge to visit. After some debate I chose Tree House Brewing in Monson. I have enjoyed every Tree House beer that I’ve had the pleasure of trying, but it is a rare occasion that I make my way out to Monson (which is pretty much the only place you can buy their beer). This week they had over 450 cases of cans of both of their flagship IPA Julius and their 3rd Anniversary IPA Alter Ego when they opened on Wednesday (plus a substantial amount for growler fills). Despite relatively limited hours both beers were sold out by Saturday afternoon. I made the trip Saturday morning, arrived 30 minutes before the brewery opened and I was still #88 in the growler line. Despite the crowd they have the process down to a science, and in a little over an hour I was back on the road stocked with cans and full growlers. While I generally stand by my stance against waiting in line, I’ll put up with it on occasion for these super-fresh and flavorful beers. This was my first chance to try Alter Ego, brewed with the same malt base as Julius but it’s dry hopped with Amarillo and Mosaic hops. 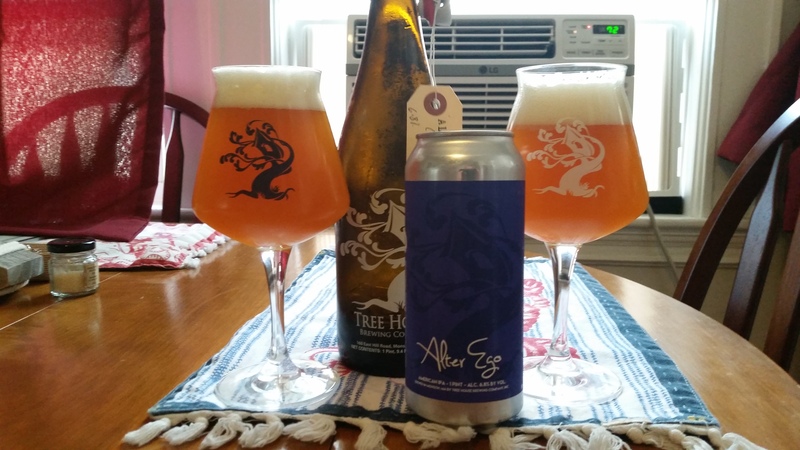 Tree House Alter Ego is available on a rotating basis on draft and in tall boy cans. Tree House Alter Ego pours a hazy deep orange with a substantial off-white head. The scent is a huge burst of hops, mostly citrus and tropical fruit. The taste is also very hop forward, notes of tangerine, grapefruit, passion fruit, pine and lemon. The hops add a noticeable but soft bitterness, you know you are drinking at IPA but it drinks very smooth. The malts provide some balance and a base to showcase the hop flavor, touches of whole grain bread and just a hint of caramel. Alter Ego is medium bodied but very easy to drink, the 6.8% ABV is about what you’d expect from and American IPA. The finish is crisp and clean with some lingering hop flavor. While Julius gets tons of hype (for good reason), it’s cousin Alter Ego is a great IPA is it’s own right, the massive hoppiness you want from an American IPA but still balanced and easy to drink. After my first glass of this beer I knew that the trip and even the wait in line were worth it! Hoppy Boston score: 4.75/5.